As the World Series of Poker is underway in Las Vegas Nevada at the Rio, just a hop, skip, and a jump away lies the Palms. But as of last week, there’s a good chance you’d find fewer poker players than usual. On June 10th, the Las Vegas property closed its poker room doors, rendering the casino pretty much useless for poker players (except those staying at the hotel and choosing to play online poker from their room). Palms had just 10 poker tables, so it doesn’t come as much of a surprise. And while The Bellagio poker room and other big players on the strip continue to attract players for cash games, during the WSOP and all year long, Palms struggled to make a name for itself. The property was known for its funky vibe and often attracted celebrities and young people looking to rub shoulders with the who’s who of Hollywood and sports. And while the resort still remains popular, poker players seem to be choosing elsewhere. Maybe it’s the fact that Palms is located off the strip. Or maybe it’s the fact that the poker room was relatively small, with less than a dozen tables at time of closing. Or maybe young people are choosing to play online. Whatever the reason, Palms decided that their casino wasn’t making any money. But it shouldn’t hurt Palms too much. In fact, if every poker room in Las Vegas closed its doors, most casinos wouldn’t bat much of an eye. That’s because poker in Nevada generated just under $124 million in 2013. Seems like a lot, right? Well, it is. But poker only generated about 1% of all gaming revenue in the state back in 2013, as it does every year. The big moneymaker? Slot machines. They brought in 60% of state gaming revenue, which is an $11 billion industry. In fact, research would suggest that video poker could be lumped in with slots. It’s likely that video poker generates more gaming revenue than live poker for Las Vegas casinos, which is why you’ll still find video poker machines at the Palms. Are you going to miss the poker room at the Palms? Do you prefer a different poker room in Vegas? 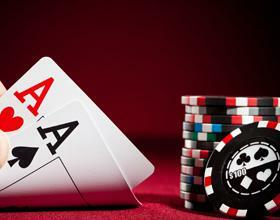 Drop us a line and tell us where you play poker – if at all.